Gemma and Eliana Singer are big iPhone fans. They love to explore the latest games, flip through photos, and watch YouTube videos while waiting at a restaurant, having their hair done, or between ballet and French lessons. But the Manhattan twins don’t yet have their own phones, which is good, since they probably wouldn’t be able to manage the monthly data plan: In November, they turned 3. When the Singer sisters were just 6 months old, they already preferred cell phones to almost any other toy, recalls their mom, Fiona Aboud Singer: “They loved to push the buttons and see it light up.” The girls knew most of the alphabet by 18 months and are now starting to read, partly thanks to an iPhone app called First Words, which lets them move tiles along the screen to spell c-o-w and d-o-g . They sing along with the Old MacDonald app too, where they can move a bug-eyed cartoon sheep or rooster inside a corral, and they borrow Mom’s tablet computer and photo-editing software for a 21st-century version of finger painting. “They just don’t have that barrier that technology is hard or that they can’t figure it out,” Singer says. Gemma and Eliana belong to a generation that has never known a world without ubiquitous handheld and networked technology. American children now spend 7.5 hours a day absorbing and creating media — as much time as they spend in school. Even more remarkably, they multitask across screens to cram 11 hours of content into those 7.5 hours. More and more of these activities are happening on smartphones equipped with audio, video, SMS, and hundreds of thousands of apps. The new connectedness isn’t just for the rich. Mobile adoption is happening faster worldwide than that of color TV a half-century ago. Mobile-phone subscribers are expected to hit 5 billion during 2010; more than 2 billion of those live in developing countries, with the fastest growth in Africa. Mobile broadband is forecast to top access from desktop computers within five years. As with television, many people are wondering about the new technology’s effect on children. “The TV set was pretty much a damned medium back in the ’60s,” says Gary Knell, CEO of Sesame Workshop. But where others railed against the “vast wasteland,” Sesame Street founders Joan Ganz Cooney and Lloyd Morrisett saw a new kind of teacher. “They said, Why don’t we use it to teach kids letters and numbers and get them ready for school?” Sesame Street, from its 1969 debut, changed the prevailing mind-set about a new technology’s potential. With its diverse cast and stoop-side urban setting, the show was aimed especially at giving poor kids a head start on education. For children born in the past decade, the transformative potential of these new universes is just beginning to be felt. New studies and pilot projects show smartphones can actually make kids smarter. And as the search intensifies for technological solutions to the nation’s and the world’s education woes — “Breakthrough Learning in a Digital Age,” as the title of a summit at Google HQ last fall had it — growing sums of money are flowing into the sector. The U.S. Department of Education has earmarked $5 billion in competitive school-reform grants to scale up pilot programs and evaluate best practices of all kinds. 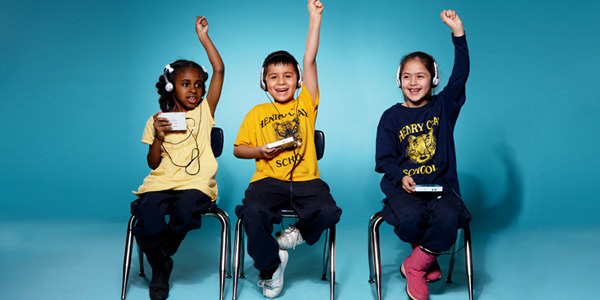 Major foundations are specifically zeroing in on handhelds for preschool and the primary grades. 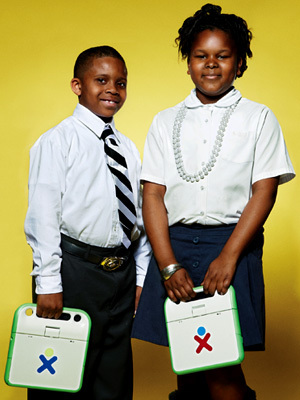 “Young kids and multisensor-touch computing are a huge area of innovation,” says Phoenix Wang, the head of a startup philanthropic venture fund called Startl — funded by the Gates, MacArthur, and Hewlett foundations — that’s entirely focused on educational investing. Google, Nokia, Palm, and Sony have all supplied handheld devices for teaching. Thousands of new mobiles — not just smartphones but also ever-shrinking computers — have come into use at schools in the United States and around the world just in the past year. To understand the transformative potential — and possible pitfalls — of this device-driven instructional reboot, you can look at the impact of one machine, the TeacherMate, that is getting educational futurists excited. It has the total package of appropriate design, quality software, and an ability to connect kids with teachers and technologists. And while it will have to leap huge hurdles — systemic, bureaucratic, cultural — to be widely adopted, it does pre-sent the tantalizing prospect of revolutionizing how children are educated by drawing on their innate hunger to seize learning with both hands and push all the right buttons. When I walk into the first-grade classroom at Henry Clay Elementary School on Chicago’s South Side, the lights are off and the room is silent. Three-quarters of the 20 children are plugged into headphones, staring into little blue machines. The TeacherMate, as it is called, is a handheld computer with a four-hour battery life. It runs full-color Flash games on a platform partly open to volunteer developers worldwide, and it can record and play back audio. Julissa Muñoz shyly tells me that she likes this device better than her PlayStation 2 at home. “They have lots of games,” she says. “I like the fireman game,” where exciting music plays as you choose the right length ladder, which sneakily teaches simple addition and subtraction. Julissa’s teacher, the delightfully named Kelly Flowers, explains that the software on her laptop lets her track each student’s performance. Once a week, when she plugs each student’s TeacherMate into her docking station, she downloads a record of their game play and generates reports for herself as well as for parents. Then she sets the precise skills, levels, and allotted time for the upcoming week. The programs are synced with the reading and math curricula used in the school — right down to the same spelling words each week. Most important, says Flowers, the TeacherMate works. She privately sorts her kids into three groups based on their reading skills — green (scoring at or above grade level), yellow (borderline), and red (underperformers). “This year, with TeacherMate, I started with 11 greens, 2 yellows, and 7 reds. By the middle of the year, I had just 2 reds. I can move a red to a yellow on my own, but this is my first year moving a red directly to a green. I’ve never seen that much growth in that short a time.” Flowers’s observations are backed up by preliminary University of Illinois research that suggests that reading and math scores in classrooms with TeacherMates are significantly higher than in those without. Flowers says the kids like the TeacherMate because it gives them a feeling of freedom. “It doesn’t feel like homework,” she says. “They can choose from a whole list of games. They don’t know that I decided what [skills] they’d be working on.” And during the time her class spends with TeacherMates each day, Flowers can devote more focused time and attention to small groups of students. TeacherMate is the brainchild of a bearded technology lawyer turned social entrepreneur from Evanston, Illinois, named Seth Weinberger, who punctuates his verbal volleys with waving hands and liberal profanity. He says he’s on year 15 of a 30-year personal life plan to transform schooling in America using technology. computer — his obsession with education making him a near-absentee dad to his own kids. Eventually, he licensed the software, which allowed him to “hire real developers who rewrote everything, laughing hysterically,” he says. Existing PDAs such as the PalmPilot and Dell Axim, on initial testing, proved a little too delicate and expensive for classroom use. So Innovations for Learning worked with a Chinese company to cheaply design and develop the TeacherMate, which debuted in 2008. Currently, it sells for $100, bundled with games customized to match each of the major K-2 reading and math curricula. The name was chosen carefully: Weinberger says he has realized that educational innovation is useless if the teachers don’t find it helpful — it can’t be a distraction, an additional burden on their time, or a threat to their authority. Innovations for Learning is partnering with Chicago’s Academy for Urban School Leadership, a not-for-profit that focuses on professional development, emphasizing that helping teachers learn to work with TeacherMate is their priority. With the backing of the JPMorgan Chase Foundation and Arne Duncan, then the superintendent of the Chicago Public Schools and now the secretary of education, IFL took the TeacherMate from its longtime cluster of 12 Chicago schools to 500 schools in 14 states as of the fall of 2009. Weinberger can’t stop talking about the TeacherMate’s untapped possibilities. It seemingly has a solution for every educational buzzword out there: differentiated instruction, English-language learners, class size. It can let a Spanish-speaking parent help a student with his homework in English. (In addition to Spanish, software is being developed in Arabic, Hebrew, and Tagalog, with a goal to get to 100 languages.) It can help a teacher track exactly how much reading is going on at home. And it can allow a math whiz to speed ahead several grade levels. While the TeacherMate doesn’t yet sport wireless connectivity, that should be coming within the next year or two. Weinberger envisions porting the software to the iPod Touch and iPad and then a next-generation of more-sophisticated machines running Android, Google’s open-source operating system. Content could expand to include science-experiment demos and immersive historical environments for social studies. We spend the next two days meeting with Mixtec and Zapotec children at campos, farm workers’ camps with rows of corrugated-steel-roofed barracks set on packed mud. We roll into the compounds in the back of a truck driven by a local missionary and hand out bags of rice and beans to the mothers, who tell me that the youth here — clad in the international uniform of hoodies, jeans, and sneakers — are struggling with borderlands issues of drugs and violence on top of rural poverty and isolation. And though schools here are supposed to run in half-day sessions, we find schoolhouses empty and locked both morning and afternoon. Kim is devoted to using cell phones to provide poor children with the basics of education and with access to all of the world’s information. “Kids love stories,” he says. “In places with no TV, no Internet, no books, when they are given these devices, these are like gifts from heaven.” He has long dreamed of a machine that is cheap, powered with a solar or bicycle charger, and equipped with game-based learning content — a complete “Pocket School.” For the past four years, he has been testing phones from a dozen different manufacturers, but the TeacherMate, which he discovered in March 2008, comes closer than anything to the Pocket School ideal. The Mexico trip is one of a whirlwind of small user-testing and demonstration projects that Kim has undertaken in the past 12 months. He has personally brought TeacherMates to Rwanda, Uganda, Kenya, India, South Korea, Costa Rica, the Philippines, Palestine, and several sites in Mexico, in most cases working with local not-for-profits, trying them out for a few hours and on a few dozen children at a time. He brings along programmers, like Freedman, so they can get feedback and tweak the software accordingly. In South Korea, Mexico, and the Philippines, schools and community centers continue to use the devices and collect data. Kim’s TeacherMate strategy, like Weinberger’s, is to let the kids figure it out by themselves. In Baja, I watch children aged 6 to 12 pick the machine up and within a few minutes, with no direct instructions, they’re working in groups of three, helping one another figure out the menus in English by trial and error, playing the same math games as the students in Chicago, and reading along with stories in Spanish. The children agree that the TeacherMates are bonitas — “cute.” An 11-year-old named Silvia asks me hopefully, “Son regalos?” (“Are these gifts?”) I have to say that they are only for borrowing. The missionary, Pablo Ohm, will keep the TeacherMates at the community center he runs in the town of Camalu, but access won’t be regular. Kim is drawing on his own painful experience with formal education. In postwar South Korea, Kim found school a conformist “assembly line.” As a “bottom 2%” performer, he was beaten regularly for major and minor infractions. “Other kids, when they were punished, would go home and tell their parents, and their parents would come to school and give the teachers white envelopes, and the treatment would get better,” he says. “But I never wanted to tell my parents what happened at school.” At the age of 19, Kim taught himself English in the library using middle-school textbooks before escaping to college in rural Americus, Georgia. Returning to Korea, he became a teacher with a passion for fostering people’s innate capacity to learn. For all his infectious passion, Kim would be the first to admit he has no specific plan for how the Pocket School might come to scale. His “development team” is an ad hoc group of volunteers — like Freedman and his 15-year-old brother, Aaron, who composed the music for the fireman game. They have altruism and lots of heart, but they don’t have a business plan. Taking a leaf from the burgeoning open-education movement — like MIT’s Open CourseWare site, which provides all of the university’s courses online for free — Rowe started the Open Learning Exchange with the redoubtable aim of providing quality basic education to 1 billion children in 100 countries by 2015. The OLE is structured as a global network of centers led by local social entrepreneurs who share materials, best practices, and new technologies. Already active in seven countries and setting up in several more, they are building a free “billion kids library” of open-source educational software and working with an eye toward adoption of technology-based educational “accelerators” by each country’s government. OLE Rwanda has launched a demonstration project with 500 TeacherMates supplied by Innovations for Learning; the project will compare them to OLPC’s XO laptop for effectiveness and cost-effectiveness. OLE Rwanda director Jacques Murinda says, “I think that the use of mobile phones in education has a great future even in developing countries. Teachers are being capacitated to use them, but children are already very creative in using them.” Another of the seven OLE centers, an organization in Andhra Pradesh, India, called the Rishi Valley Institute for Educational Resources, is also trying it out. Use of the TeacherMate, if successful, is likely to spread to other OLE centers; that’s what the exchange is designed to do. Mobile phones have transformed communications, especially in the developing world, more swiftly than anyone could have imagined. The prospect of doing the same for education — putting best-of-breed learning software in kids’ hands anytime, anywhere — is tantalizing. Yet not everyone is so excited about what might be called the iTeach future. But the biggest challenge to Pocket School — style learning may not be the business model. The same possibilities that make these technologies so exciting — the sight of Gemma, Eliana, Julissa, and Silvia pushing the buttons, controlling their own learning and their own destiny — make them threatening to the educational status quo. A system built around tools that allow children to explore and figure things out for themselves would be radical for most developing-world schools, which emphasize learning by rote. In the United States, which is currently so in love with state curriculum benchmarks and standardized tests, it could be just as hard a sell. Anya Kamenetz is the author of the new book DIY U: Edupunks, Edupreneurs, and the Coming Transformation of Higher Education.